The main element of this system are Rail strips to attach pipes. 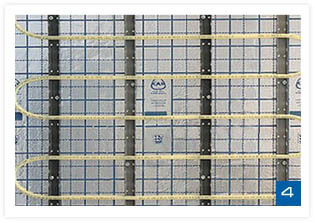 Rail strips can be fastened directly to a floor or glued with an adhesive tape to KAN-therm styrofoam plates with foil. 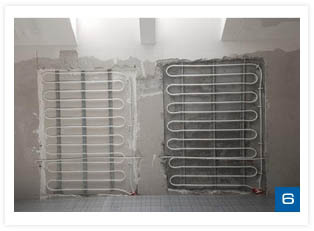 The KAN-therm Rail system has proven itself very good in wall heating systems. 1. 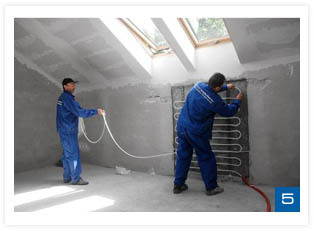 Floor heating system – first step: laying wall tape along construction partitions of a room. 3. Floor heating system – Individual styrofoam sheets shall be joined with an adhesive tape for a better insulation on the screed side. Identically proceed with the foil on the edge tape. Overlay the foil on the styrofoam and join them with the adhesive tape. 4. Floor heating system – fasten the plastic strip on a spread styrofoam sheet with an adhesive tape. A pipe is put into special holes in the Rail strip. 5. Wall heating installation – plastic strips attached to a wall with expanding dowels. A pipe is inserted into special holes in the Rail strip attached to a wall. 6. Wall heating installation- to specially adapted holes a Rail pipe is inserted into bar installed on the wall.